Christ is My Life. 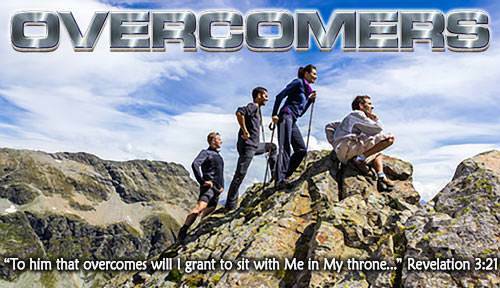 Lesson 10 in "Overcomers"
What is the Christian life? Is it that Christ is in Heaven and I am down here by myself, trying to live for Him? Is it asking, "What would Jesus do?" and trying to imitate Him? Is it doing my best to be good and asking the Lord Jesus to help me? • I am in Christ. 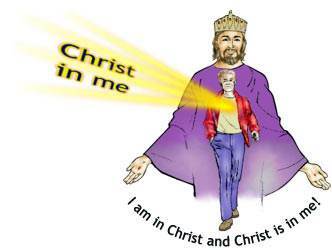 • Christ is in me. Through God's Word we learn that we are "partakers [sharers] of the divine life." This means that I share Christ's life. I am in Christ and Christ lives in me by His Spirit. 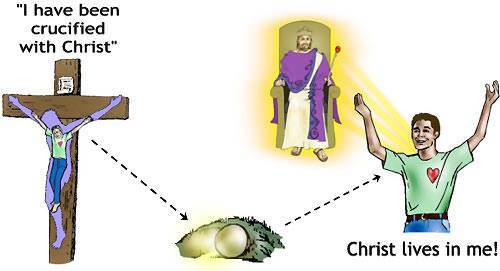 To help us understand this new relationship between the Lord Jesus and the believer, Jesus used a picture from nature. 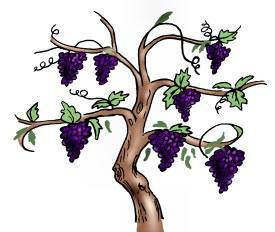 Speaking of a grapevine, He said, "I am the Vine, you are the branches..." (John 15:5). The Lord Jesus is the Vine, and the believers are the branches. So when "the vine" is mentioned, let us think of the Lord Jesus, and when "the branches" are mentioned, let us think of ourselves. From the vine and the branches we can learn some wonderful truths about the Christian life. • The vine and the branches are one. They share one life. The same life, the sap, that flows through the vine also flows through the branches. We see from this that our union with Christ is a living union. We share one life. • The branch is in the vine. As we look at the vine and its branches, we see that the branch is in the vine. This teaches us that we are in Christ. We have already learned this great truth, that we are in Christ, but now we see that we are joined to Him in a living relationship. We were not always in Christ. Before we trusted Christ as our Savior, we were in Adam's sinful family. We were in Adam. We shared his life and we had his nature in us. What happened when we were saved? God took us out of Adam and put us into Christ. 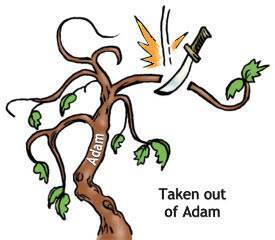 We were cut off from Adam and "grafted" into Christ. To graft a branch means to take it out of one vine and join it to another vine. The branch is cut away from the old vine. Then a cut is made in the new vine, and the branch is fitted into this cut place and securely wrapped. Soon something wonderful happens. The life of the new vine begins to flow through the branch. The branch is now sharing the life of the new vine, and it begins to bear its fruit. From this we can see what a wonderful thing God did for us. 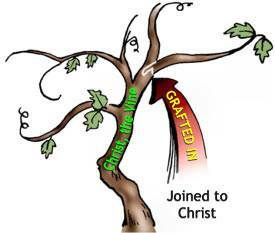 God took us out of Adam and "grafted" us into Christ. We are now joined to the Lord Jesus in a living way. 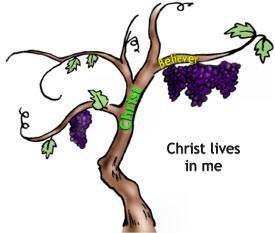 He is our new Vine, and we are living branches in Him. We share His life. The Bible says that we are "partakers [sharers] of the divine nature [Christ's life]" (2 Peter 1:4). • The vine is in the branch. 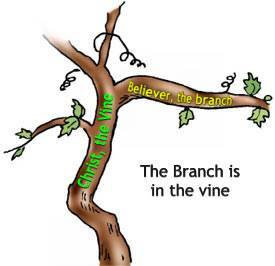 Not only is the branch in the vine, but the very life of the vine, the sap, is in the branch. This is what keeps the branch alive and causes it to bear fruit. This teaches us that not only are we in Christ, but Christ is in us. We have the very life of Christ in us. Paul did not say, "I am trying to imitate Christ." He did not say, "I am going to do the best I can and ask the Lord to help me." He said, "For to me to live is Christ" [His life in me]." Christ does not want to be my Helper; He wants to be my life. If we see a branch loaded down with beautiful grapes, we might ask the branch, "How did you bear all this beautiful fruit? What is the secret?" If the branch could talk, it would say, "The secret is that the life of the vine flows in me. Everything I need is in the vine. I depend on the vine for everything." The Lord Jesus wants us to learn the lesson of the vine and the branches. He is our "vine," and we are "branches" in Him. Everything that we need is in Christ and we have His life flowing in us. Read this verse out loud. Isn't that beautiful! Write this verse on a piece of paper and say it over and over until you have memorized it. Now let us see from this verse the four steps in living the Christ-life. Know that you died with Christ. "I have been crucified with Christ." This is God's way of dealing with my old life. God put me in Christ on the cross. I died with Christ; that was the end of my old life. "Nevertheless I live." Christ rose from the grave and I rose with Him. I am a new person in Christ. Know that Christ lives in you. "Christ lives in me." This is true of every believer. What happened when I became a Christian? I "received Him" (John 1:12). He actually came to live in me. He lives in me right now! Nothing could be more wonderful. Take SELF out of the way. "Yet not I." Christ wants to live His life in me, but something gets in His way. What is it? It is SELF! My biggest problem is SELF! What is the solution to this problem? The solution to the problem of SELF is to take myself out of the way so Christ can live His life in me. God says that SELF belongs on the cross and Christ belongs on the throne in my heart. I agree with God. I say, "SELF, you shall not rule in my life! Christ is my Lord and my king! He shall rule in my life." A little girl named Carol had received Christ as her Savior when she was very young. When she was ten years old she longed to be a good Christian. Her father spent much time with her, teaching her from the Bible. He showed her that the one way of victory over sin and SELF was by accepting our death with Christ and letting Christ live His life in us. "I truly died with Jesus, and I put away my old Carol on the cross with Him on the 4th day of October. I mean to live by His life, and for Him, all my life. Not I, but Christ." "The life which I now live, I live by the faith [the faithfulness] of the Son of God, who loved me, and gave Himself for me." Everything I need is in Christ. God tells me not to worry about anything. In fact, He commands me, "Be anxious for nothing." In myself I worry about things; I cannot keep that command. But Christ lives in me. He does for me what I cannot do for myself. I just count on Him to do it, and He does it. He is the faithful One! I have found the secret of living. What is it? It is counting on Christ who lives in me. It is "not I, but Christ." I count on Christ for everything I need. Perhaps I have a bad temper. I have tried for years to overcome it. Now I turn it over to Christ, the faithful One, who lives in me. He takes care of it, and it is gone. A little girl had learned to have victory over temptation. Someone asked her, "How do you overcome when you are tempted?" She said, "Before, when the devil came knocking at my door to get me to do something wrong, I would go to the door and say, 'Don't you come in! Don't you come in!' But He would come in anyway. "Now, when the devil comes knocking at my door, I say, 'Lord Jesus, will You please answer the door.' When the devil sees the Lord Jesus, he bows low and says, 'I am sorry. I have come to the wrong door.' And he turns and leaves." What if I fail? What should I do? I should confess my sin and put it under the precious blood of Christ. In the very next moment I can say, "Lord Jesus, You are still my life and my victory, You shall live out Your victorious life through me." My old life ended with my death with Christ. I am a new person in Christ. Christ is my life and my victory now. "Lord Jesus, I have seen from God's Word that my old life ended with my death with You. I do not want SELF to rule in my life any more. I am now putting my old life on the cross with You. I now choose to live by Your life, instead of SELF. From now on, it will be not I, but Christ living in me."